VERSATILE--The Provincial Cottage Extension Table can host a candlelit dinner with roses and champagne or a Sunday brunch with biscuits and tea. Dress it up with your lace tablecloth or leave it bare to display the first class wood tabletop. ACCOMMODATING--The magnificent double pedestal base allows extra guests at each end of the table. Gather around and rest your feet on the slim bridge. Add extra leaves to extend even more. CUSTOM MADE--Choose from Brown Maple, Cherry or Rustic Cherry or Red Oak or Quarter Sawn White Oak Wood. You choose the finish and dimensions, confident in the fact that your table is handcrafted by an experienced Amish Woodworker. UNIQUE--DutchCrafters furniture offers creations that you won't see anywhere else. Only the finest materials are used to make your table, resulting in a piece that will last. 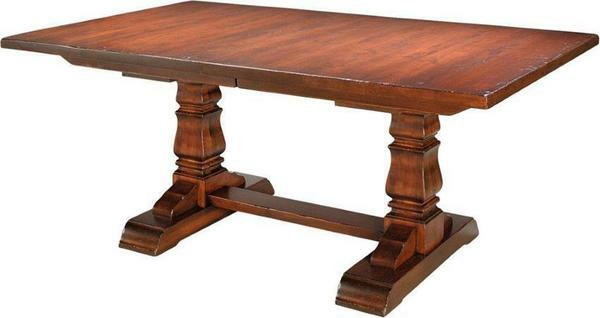 The Provincial Cottage Extension Table is a table no one will rush to leave. Make it part of your home decor for only 30% down.